It’s Wednesday so pull your seats up to the roundtable and let’s discuss college football! TSS Associate Editors Bart Doan and Terry Johnson join Kevin Causey in our weekly roundtables discussing all things college football. Last week we discussed the most intriguing spring storylines and changes that we want to see made to spring football. Today we dive into a discussion about college football coaches, past and present. Question: You have one game to play and can pick any coach from the history of college football, who’s your pick (must have been a head football coach in college at some point in his career)? As much as this will seem like a total prisoner of the moment, cop out answer, I’m taking Urban Meyer if I get a choice. You just sort of concede the fact that it’s tougher to be the CEO of a football program now than at any point in history, what with social media, the pedantic level of fan involvement and scrutiny, and the expectations that are often baseless and overwhelming. Coaching has never just been the iconic “give me sticks and I’ll draw up a play in the dirt” that people make it out to be, but that’s even more true now. Meyer’s meticulous and visionary offensive styles … especially offensively … have made him arguably the best coach of his generation, and he’s done it at every level. He won at Bowling Green, so he went to Utah. He won at Utah, so he went to Florida. He won at Florida, so he went to Ohio State. This is probably his last stop. On top of that, the measure of any truly great coach is the ability to get everything out of your players whether they fit your “ideal” roster or not. Meyer proved he could do this during his first title at Florida, where Chris Leak probably never would have been recruited to play in his offense and was exchanged out for freshman Tim Tebow (remember him!?) at times, which could have caused both friction and an effect in play. Meyer was able to get the most out of a team that didn’t necessarily fit totally what he’d do if every player on the roster was recruited by he and his staff and won a title with it. On top of that, his first year at Ohio State with a roster full of highly recruited … but not by his staff … guys, they went unbeaten. When you toss in the off field stuff that it takes to manage a program these days, Urban Meyer to me is the clear answer to this question. As a Georgia guy, I’m probably going to get killed on this but I’m going with Steve Spurrier. As it stands right now, Spurrier is a good coach who has great moments from time to time but is more known for his quick wit and fantastic sound bites that he gives the media. The Spurrier that I’m talking about is one that existed before he ventured into the NFL and his forgettable run with the Washington Redskins. I’m talking about the brash, young Steve Spurrier who took no prisoners and made no excuses. From 1993 to 1998 Spurrier posted a record of 65-10-1 (85.5% winning percentage) overall and 43-5 (89.5% winning percentage) in the SEC. Spurrier was simply a “special” coach during these times. He was labeled a genius and an offensive mastermind and I would take him during that run because I think that at that point in his career he could take his offense and run it against any team and any coach from any period of time given the right motivation and the right amount of time to plan for the game. And I’d much rather have Spurrier on my sideline than the opposing one. While there’s nothing wrong with using the “eyeball test”, I’d want to dig deeper than that. After all, since I want to win this hypothetical contest, I would need to take emotion completely out of the equation, and use facts to support my argument. So what does this mean? In a nutshell, this coach would need have a great win-loss record, including a stellar mark in big games. The ideal coach would also be someone who fared well against other top coaches. Using these metrics as my guide, I’d pick Buffalo’s Lance Leipold to coach my team. Despite reaching 100 wins faster than any coach in college football’s storied history, Coach Leipold remains one of the best-kept secrets in the game today. In eight seasons at Wisconsin-Whiterwater, Leipold guided the Warhawks to 109-6 record, including an amazing 34-1 mark in the playoffs. Under his leadership, UWW appeared in the Division III title game seven times, winning six of them. In other words, during Leipold’s tenure at Wisconsin-Whitewater, it was more likely that the Warhawks would appear in the National Championship Game (seven times) than it was for the team to lose a game (six times). To that, I’d like to make two very important points. First, Leipold’s record is every bit as impressive as the coaches referenced above because it was at the Division III level. Remember, D3 does not allow athletic scholarships, which means that the coaches have to work whatever student-athletes are on campus. It’s much more difficult to maintain a championship caliber program under those circumstances than it is at a school like Alabama or Ohio State, where coaches have the option picking and choosing from the best players across the country year in and year out. Second – and most important – it’s worth noting that Leipold has fared well against the game’s top coaches. While he never faced Nick Saban or Urban Meyer, he did coach against Larry Kehres five times in the national championship game, winning four of them. For those of you that don’t follow Division III football, here’s why that’s such a big deal. In 28 seasons at Mount Union, Kehres compiled 332-24-3 record (.928 winning percentage), and won 11 National Championships. 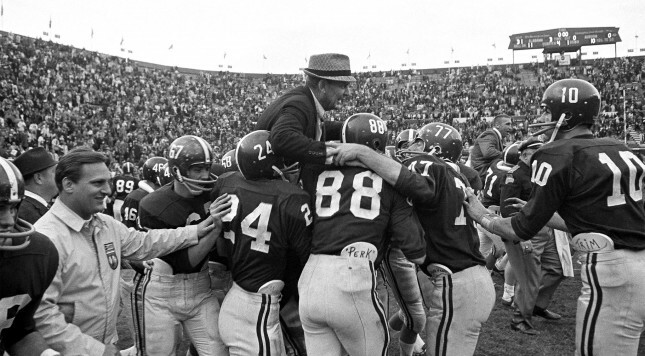 His teams were even tougher to beat towards the end of his career, as the Purple Raiders reached the National Championship Game in 15 of his 17 final seasons, hoisting the championship trophy 10 times. Few coaches at any level of college football can match those numbers. Yet, Leipold won four of five head-to-head meetings against him, which is why I’d want him on the sidelines for this hypothetical, win-or-go-home contest.